Hi there! 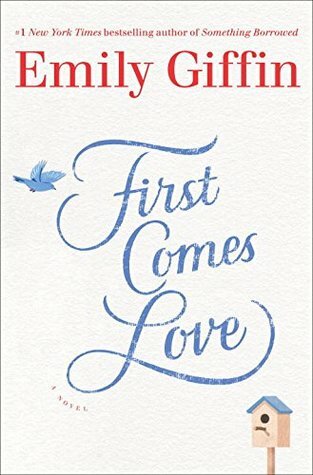 Today I’m sharing a review for a women’s contemporary read from Emily Giffin. I had thought FIRST COMES LOVE would be a romance, based on the title, but it was a family drama that touched a lot of nerves for me. The Garland family suffered a horrifying tragedy just before Chirstmas fifteen years ago: the eldest son, Daniel, a med student and all-around great guy, was killed in a car wreck while home visiting his family for the holidays. A year later, his parents divorced. His sisters, Josie and Meredith, are still shattered by the loss. Josie is a 37 year old first grade teacher. She’s always been the pretty, party girl, and long suspected that Daniel was out on that icy December night to pick her up from a bar, where she’d been black-out intoxicated. She’s been to Daniel’s grave only once in fifteen years: the day of his funeral. Her relationship with Meredith has always been strained by sibling rivalry, but they are virtual strangers to each other at this point, their only true connection Josie’s huge love for Harper, her niece. At this point, Josie’s done looking for Mr. Right. She has good friends, a solid job and the only missing piece is a child of her own. She’s considering single motherhood, very seriously. Meredith’s life is far different at 35 than she expected it to be. She’s a lawyer, not an actress. She’s living in her childhood home, with a veritable shrine to Daniel just down the hall. She’s married to Nolan, Daniel’s childhood best friend–and she’s woefully insecure underneath her tough veneer. Did she accept Nolan’s proposal on account of Daniel? Did Nolan propose out of some perverted sense of duty, or guilt? Does she even love her husband? She’s in therapy, and trying to work things out, and struggling with the choices she feels she made out of duty rather than desire. And, she’s jealous of Josie, who, she believes, rather selfishly always made her own way. This book isn’t a breeze read. It’s filled with regret, remorse and recollection. Josie and Meredith tell the story with dual viewpoint, and it’s tough to see how these good folks find themselves still so lost, fifteen years after Daniel’s sudden death. I personally recognized certain elements from my own family in the aftermath of my Grandfather’s death–where paths quickly changed and relationships soon soured. When beloved people, caught in a trap of mourning, made decisions they later regretted. So, I got that. I also recognized Meredith’s deep unhappiness in her marriage–which I think a good number of people can relate with–for unhappiness within herself. I was shocked and satisfied with Nolan’s take on it all. While the whole ‘if you love someone, let them go’ idea is still a little counter to the romance ‘dogma’, I think it mainly worked here. Josie and Meredith have a lot of fences to mend, and I applauded the role of Gabe, Josie’s best friend, for his unshakable support, and also speaking plainly to Meredith about her callous treatment of Josie. I think it’s easy to dislike Meredith, because she’s so cold and harried, and ungrateful for what seems a “perfect” life, but she’s also incredibly human, and an approachable model of many working mothers. The loss of one person, at the wrong time, often has far-reaching effects within a family. I’ve seen this happen in real life, and I deeply sympathized with the characters as a result. That made this book a far more difficult read, personally, for me. The marriage issues were also tough to take, as I know I’ve had similar introspection as Meredith. No one likes looking at a difficult reflection, after all. The book resolves in a way that makes it seem as if the ship has changed course and is bound for brighter shores. It’s still a long journey toward healing, but the heading is right and the wind is fresh and strong. I really liked it, even if it didn’t leave me glowing. Interested? You can find FIRST COMES LOVE on Goodreads, Amazon and Barnes & Noble. I received a review copy of this book via NetGalley. Emily Giffin is a graduate of Wake Forest University and the University of Virginia School of Law. After practicing litigation at a Manhattan firm for several years, she moved to London to write full time. The author of seven New York Times bestselling novels, The One & Only, Something Borrowed, Something Blue, Baby Proof, Love The One You’re With, Heart of the Matter, and Where We Belong, she lives in Atlanta with her husband and three children. FIRST COMES LOVE is her eighth novel. Catch up with Emily on her website, Facebook, and twitter.